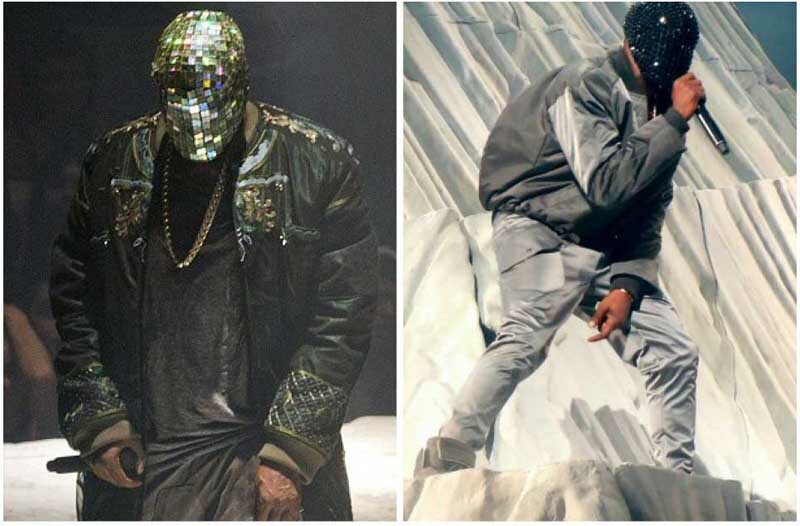 DALLAS, Oct 22, 2013/ — While fans of Kanye West are reeling with excitement with the rapper’s Yeezus tour which began Saturday, October 19th, fashionistas are abuzz with the news that Maison Martin Margiela created custom-made outfit for the famed American singer. Embroidered bomber, blanket coat, printed trousers, crystal or marble veils have been reinterpreted from the Maison’s archives and handmade in the Parisian atelier for the Yeezus tour. An exclusive pair of sneakers has also been specially developed. As seen here, Kanye is wearing artisinal elongated embroidered bomber and mirror veil (left) and bomber jacket and artisianl silk trousers and black gems veil (right).